I always dread this Top Ten Tuesday topic (and I say so every time), because while it may get me excited for what I'll (hopefully) be reading soon, it's just a friendly reminder of all the books I didn't get read off the previous season's TBR. (I had sixteen books on my summer TBR, and I read four.) And even though school starts tomorrow (and I have to read like a million mostly unheard of classic-esque books for one class, please send help), I'm really trying to get better at spending more time reading, fitting in blogging, and not spending as much time just being lazy and unproductive. Therefore, I'm crossing my fingers that when I post my TBR for winter, I'll be able to tell you that I read all ten books on this list: my fall TBR. Illuminae is so amazing, I can barely put into words how much I love this book. I was intimidated by the format but it was so well-executed! I am SO excited about Winter. I can't wait to get my hands on a copy. Great list! I'm looking forward to all of these, but Velvet Undercover sounds really promising! Winter and Wolf by Wolf are 2 books that are on my 2015 TBR. For my Fall one, I stuck with books I already have. I will have Winter come November.. I have to see how it ends! I'm really looking forward to Winter too! I've heard The Naturals is like Criminal Minds. I like the show so may check that series out. I can't wait for Winter!!! I also have The Anatomical Shape of a Heart. The Distance from Me to You looks good - Great list!! Ah! I forgot to put The Anatomical Shape of a Heart on my list. I can't wait to read Illuminae and Winter either! The Wendy Darling book sounds good! I hadn't heard of it before this list, so thanks :) I am also interested in The Naturals series. It sounds amazing! Can't wait for Winter here either (the book and not the season, haha!) :) I'm going to check out some of the books on your list, I hadn't heard of a few of them but they sound good!! I can't believe I forgot Illuminae! All day it's been staring me in the face, making sad eyes and asking how I could have forgotten it. Don't fear, giant 600 page book...I'll read you soon! Great list, good luck with it! Velvet Undercover sounds super fascinating! I love WWI books; they are so much more rare than WWII books. Great list! I'm dying waiting for Illuminae and Winter! Hope you love them all! I have seen Winter on so many lists this week and I am looking forward to it as well. It should be awesome. I can't wait to read Winter! I hope we love it as much as we all hope. I'm very curious about Da Vinci's Tiger. I hope it's awesome. I'll be on the look out for your review. You can do it!! This is a really, really good list! I loved Illuminae, and I am so excited for Wolf by Wolf, The Distance from Me to You, and The Anatomical Shape of a Heart. 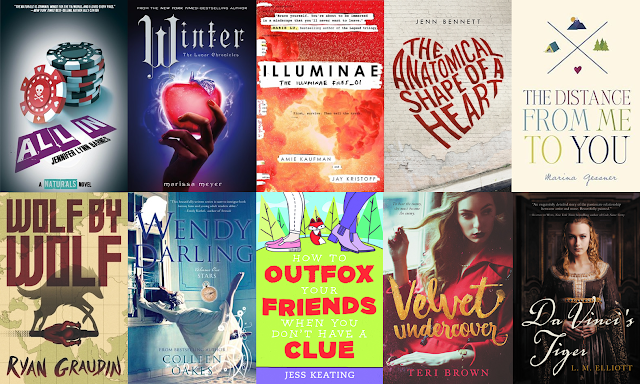 Some of the others I am curious about too (and I am sure I'll be excited for Winter as soon as I read Cress!) Hope you love them!